Giuseppe Scapinelli, set of 2 customized lounge chairs, caviuna wood and fabric, Brazil, 1950s. Rare and exclusive pair of armchairs by renowned Brazilian designer Giuseppe Scapinelli. This chair exposes a sculptural yet playful design with a voluptuous seat and elegant legs. The bulky, rounded arms that point slightly upwards are sweeping and noteworthy. The tapered legs are made caviuna wood, positioned in slanted position that attributes to the playful look of this chair. The combination of the voluptuous seat and the tapered legs are very typical for the designs of Giuseppe Scapinelli. This extraordinary set of chairs is part of the customized Midcentury collection. Every piece is carefully selected by our team for restyling according our philosophy, resulting in a new life for these highly potential pieces of furniture. The chairs are fully restored and reupholstered by the experienced craftsmen in our in-house atelier. For the reupholstery, our team chose carefully for a combination of two high quality fabrics of the Dedar collection. The armrests are reupholstered in an Italian-made cotton velvet, while the seat is upholstered in a sensational wool boucle in majestic burgundy with red ruby accents. This is a great example of the almost endless possibilities our team has to offer, and how we can help you with the reupholstery of one of your favorite pieces in our collection. Giuseppi Scapinelli (1891-1982) was a designer, furniture maker and dealer in Sao Paulo. Scapinelli, born in Italy, was a designer who was on top of the zeitgeist. His designs is voluptuous, generous and comfortable. The rounded curves combined with the clean lines of the back hint towards his Italian origins. The chairs are fully restored and reupholstered by the experienced craftsmen in our in-house atelier. 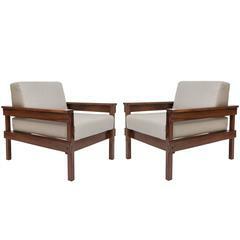 Pair of 1960s Brazilian caviuna armchairs upholstered with leather. 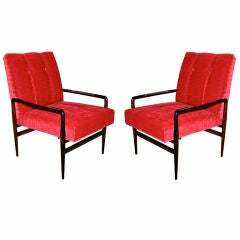 Pair of beautifully restored 1960s Brazilian jacaranda armchairs upholstered in red mohair. Pair of armchairs in red terra velvet style with beautiful shaped wooden legs, Italy, 1950s. 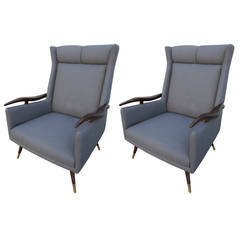 Pair of very comfortable 1950s Brazilian lounge / armchairs chairs with wooden arms and brass feet.